Skype lets you make free PC-to-PC calls anywhere in the world. With a subscription, you can also make calls to external phones and receive phone calls using an online number. The following Skype tips and tricks will help you make the most of the service. The Skype welcome screen features a handy shortcut for testing your sound devices. Click 'Check your sound works', then click the button to test each device - speakers, microphone and video (if applicable) - in turn. If the test fails, Skype will make some basic suggestions to remedy the problem, like making sure your headset port (typically the front mic) is selected as the default device. Follow the instructions to see if you can fix the problem. Skype will offer to make a test call for you - you'll dial a number, hear a female voice and then attempt to record a message. This will let you check the sound quality of your microphone and ensure it's at the right volume. Skype automatically adjusts your mic and headphone's volume to try to fix potential problems, but you can also tweak these settings yourself by selecting 'Tools | Settings | Audio settings'. You can click 'Show advanced options' to set default devices. Skype works with any microphone, speakers or headphones provided they're properly installed. This includes Bluetooth headsets as long as your computer has a Bluetooth receiver. With your PC's Bluetooth receiver switched on and your headset in pairing mode, double-click the Bluetooth icon that appears in the notification area of the taskbar and click 'Add' under 'Devices'. Tick 'My device is set up and ready to be found', then click 'Next'. Wait while Windows tries to locate the headset. When it appears in the list, select it and click 'Next'. Select the appropriate settings according to your headset's manual and, if necessary, enter the passkey. Click 'Next' to see the device connected and set up, then click 'Finish'. Having a full list of contacts saved in Skype will make setting up calls a much simpler process. You can add an individual contact by choosing 'Contacts | Add a contact', then entering the relevant information manually. If the person you're contacting is already on Skype, he or she will receive a contact request, but you can also import multiple contacts from a list or from an existing webmail or Facebook account. Choose 'Contacts | Import contacts'. Now select the type of account you want to import from and provide your username and password to connect to that service and transfer the data. If any of these people already have Skype accounts associated with their email addresses, they will be listed. Click 'Add those contacts' to send them a contact request. Names and phone numbers will be stored for you anyway. When you're signed into Skype, it can act as an instant messaging program similar to Yahoo or Windows Live Messenger. You can exchange text messages with online contacts or move to an audio call at any time. Just select an online contact, type in your message and click 'Send' to start a conversation. In your settings you can choose whether other users can see an animated pencil while you're typing something. You can also set Skype to receive messages from people in your contact list only, and you can opt to keep a history of all your conversations. Choose 'Tools | Options' and move to the 'IM and SMS' tab before clicking 'Show advanced options'. You can now change any of these settings to suit your preferences. By default, Skype is set to start when Windows launches. This is handy if you want to be available to talk at all times, but it can be an irritant if you need to get on with some important work without any interruptions. You can set Skype to only launch when you open it, by choosing 'Tools | Options | General settings' and clearing the box marked 'Start Skype when I start Windows'. Click 'Save'. While here, you can also set the visual style of Skype. By default this is the Skype style, but you can choose Classic Windows instead. You can change the default sounds used by Skype by clicking the 'Sounds' icon and selecting the sound that you want to use. To make calls to phones, you need to buy a Skype subscription or Skype credit. Click 'Skype | Account', then 'Buy more credit' or 'Get a subscription'. Most subscriptions give you a number that lets people call you on Skype from landlines. Start by choosing 'Online number' and clicking 'Set up now'. Pick a country from the list - people calling you from that country are charged local rates, so it's perfect for keeping in touch with friends and family abroad. There's a limited number of area codes available, so pick the one closest to you and then click one of the suggested numbers or try to pick one of your choice. Untick the box if you don't want this number to be displayed when you call phones through Skype, then click 'Activate number'. You can set up your voicemail to take messages when you aren't online. To do this choose 'Tools | Options | Calls | Show advanced options'. Now select 'Voicemail' from the left-hand pane. Tick the box marked 'Send unanswered calls to voicemail'. Click the 'Record' button and use your microphone to record your outgoing message. If you don't record a message, a default one will be used instead, but it makes sense to record your own to give a more personal impression. You can also opt to send calls to voicemail if you reject an incoming call or if you're already on a call by ticking the relevant options. Finally, click 'Save' to store these settings. Extras let you add more functions to Skype via plugins. In the latest version of Skype the Extras Manager is disabled by default, so when you choose the Tools menu, the 'Extras' option is greyed out. If this is the case, you need to uninstall and then reinstall Skype. Download the version of Skype provided on the Extras page. This is a slightly older version of the program. While the software is installing, click 'Options' on the Hello screen, tick 'Install Skype Extras Manager' and click 'I agree - Install'. Once complete, sign back into Skype and choose 'Tools | Extras | Get extras'. Browse through the catalogue of extras and click the green button next to one to install it. Some extras let you share a whiteboard or play games with people on your Skype contact list, while others provide handy recording facilities. One such extra is MP3 Skype Recorder. This is a free program that automatically records all your Skype audio conversations and saves them in MP3 format. It can cover Skype-to-Skype calls and SkypeOut calls to a landline. It sits in the system tray monitoring Skype and starts recording automatically when you make a call. You'll need to inform any other participants in the call that it's being recorded, especially if you plan to rely upon the recording later on. Each call is saved as a separate MP3 file and stored in the default save location. MP3 Skype Recorder is even capable of recording multiple calls that take place at the same time while one of the calls is on hold. You can add a Skype button to your website or blog that lets visitors know if you're online. If they have Skype installed on their PC, they can call you with a single click. You can even add the button to an email signature so that the recipient of any of your mails can quickly click it to call you to discuss the contents of the email. 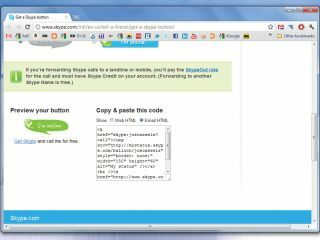 Get your own Skype button and enter your username. Select the button style that you want to use from those provided. Once you've provided these details, a preview of your button will be shown below them and alongside it the embed code that you can include in a web page or email. Copy and paste this code as HTML source into your website or email signature file.